Google’s famous for it, Flickr’s moved to Gamma, Moo are on an eternal 1.0 – yet still in institutions we plod on with a tired, slow-moving and opaque process for developing and enhancing applications. From our closed support lines to official notices on unread websites and applications mysteriously changing in front of a user’s very eyes we look staid and tedious. But it doesn’t have to be like that, we could be fast faced and interactive – but at what cost? Continuity? Uptime? One of the leading ideas of eternal beta is small improvements all the time. It’s the preferred model for developing Web 2.0 applications (just look at Google, Yahoo, Microsoft and about a billion Silicon Valley startups). The essence is that if you’ve changed something small and you’re waiting for the next milestone before you release, you’re crazy – just deliver it. If it turns out to be wrong or broken in some way, you can just change it again. One of the big fears that it hasn’t been user-tested enough. Well, in institutions we’ve got thousands of technically-minded members – staff and students alike; what do you think the odds are on being able to make, say, twenty of them beta testers? (It’s critical to get testers from outside your team; your team are effectively the alpha testers) I mean, you’ve probably got bloggers, Facebook group founders and tech contacts everywhere. See who you can find to test your apps – it doesn’t have to be the same people for all of them, and make it worth their while either by delivering a better application to them than everyone else, or maybe some mark of kudos inside the application that everyone else can see. This does rely on being able to get good feedback from your testers – hey, you’d hope that if your software is good enough they’ll be telling you anyway, but you can use incentives or whatever floats their feedback-giving boat. The important part is exposing the feedback communication channel; maybe it’s a forum, maybe it’s blog where you post the new features and they add comments, maybe it’s a weekly meetup in the bar. Whatever you do, talking to those people and making sure that they can see that there are other active testers, whom you’re listening to and actually replying to is A1 critical. No trust == no good feedback. The other big fear is that this basically throws traditional software development and delivery out of the window (farewell, cruel Gantt chart). When a team suddenly has deliverable dates measured in the days rather than the months you suddenly discover that the priorities change and you start getting people-focussed software rather than something focussed on year-old requirements. This is where agile techniques start kicking in. Things like pair-programming, continuous integration, automated deployment are all your friends. Techniques like PRINCE2 and Scrum are there to pick up the rest of the slack. In the real world, although my team isn’t quite there yet (notably with the feedback), we’re trying hard and it’s paying dividends in terms of delivered software and happier users. Today’s guest blog post comes from Ross Gardler, manager of JISC’s OSS Watch service and a co-facilitator of a workshop session at IWMW 2007 on “Sustainable Services: Solidity based on Openness?”. The full list was far too long to detail in this post, but a few were clearly more important than others. This became particularly evident when we proceeded to evaluate a number of well known Web services against the defined criteria. For example, data access was critical in most Web services. Was the data available in an open standard that made it interoperable with other services? Having put data into the service, could you get it out again? Flexibility was another major concern for the API approach. Did the API allow us to achieve what we want to achieve? Workshop participants also noted that there is no guarantee that a service will be provided in the future. A topic that Brian Kelly discussed here in this blog when Splashblog closed its doors. Brian suggested that such closures could be considered by some to be a clear justification for not making use of such external Web 2.0 services – a point made by a number of our session participants. Indeed, many services were marked down quite heavily since they are largely unproven beta services with no clear business model. Despite this healthy concern over the longevity of service offerings, workshop attendees felt that some services, such as Shibboleth, are more sustainable because they have public money behind them. However, as Brian goes on to observe, even public sector services are not guaranteed to be there forever. To support his point Brian cites a BBC news article describing the closure of 551 government Web sites and wonders what happens to data held by the AHDS when funding ceases. The overall conclusion of our workshop attendees was that Web services should only be relied upon for non-critical functions in your institution. Over time we may become more comfortable with relying on third party services, but for now we need to be careful. I liken it to the development of voice communications technologies. We don’t worry about having a dial tone the next time we pick up the phone, but the recent Skype outage shows we can’t rely on the newer voice communications services. The result is that Skype is not suitable for emergency calls. In my opinion one way of moving towards more sustainable services at a sensible pace is through openness in the development of those services. That is, if a service uses open data standards, provides fully open access to all its data and its APIs and encourages users to participate in the ongoing development of the service, I, as a user, am more likely to stick with it past my initial, experimental, use. For example, I love the idea of Dopplr, but I haven’t gone past exploration because it fails to provide the data in format that is useful to my objectives (Editor’s Note: Phil Wilson pointed out that a Doppler API has recently been announced at http://dopplr.pbwiki.com/. This comment was added at the request of Ross Gardler on 6 Septmeber 2007). Conversely, just 10 hours after the announcement of a beta API for OhLoh I had integrated OhLoh data into Simal, the OSS Watch project cataloguing tool. As soon as OhLoh produces an API for submitting data I’ll ensure the flow is two way, making both projects more likely to survive. However, openness should not stop at the data and the APIs. I need to ensure that the service remains aligned with my strategic objectives. I want to be able to contribute directly to the flexibility and sustainability of the service in ways that suit my needs. This is where Oh Loh falls down, it is not open source and so my contribution options are limited. Open source enables us, as users, to choose how to invest our resources in sustainable solutions. We can purchase related products such as support and hosting, or we can fund strategic development, or we can ensure our own staff help support and sustain the product through direct contribution of use cases, documentation, feature requests, bug fixes and even new feature implementations. All of these actions help ensure the product survives and continues to be available to our own organisation. Web service companies will gladly accept similar contributions from us. The big difference between the two approaches is that with open source we have the freedom to decide where our resources are invested. We can maximise the impact our investment has on our individual utilisation of the service, thus making the service more useful. We are even free to take the software and create our own version should our objectives diverge considerably from the originating service provider (although this can usually be avoided if the project is well managed and cultivates a healthy community). Most of us want the convenience of a service provider, but such convenience comes with the risk of potential lock-in and, even worse, the loss of a critical service. Having access to the source code means that we increase competition and consequently increase innovation in the code base. It does not prevent companies from differentiating themselves through the provision a more reliable and usable service within their chosen market niche. Given the choice, I will always use a Web service that makes its source code available under an open source licence, even if that service is less developed than closed competitors. In most cases I will still purchase the service from a provider, but I want to keep my options open in order to ensure my own offerings are sustainable. Our workshop participants largely agreed with this view, they too were more concerned about having control over their own organisations future in the long term than they were about the short term gains of adopting closed service models. Today’s guest blog post was written by Debbie Nicholson, of the Web Support Unit at the University of Essex. Debbie writes about the Institutional Web Management Workshop and the discussion group session she attended on “The Web Community” and the implications for the Web community. I didn’t sign up for this discussion group … I signed up for one of the Greener Web discussion groups. I got a bit seduced by the idea of the whole Web community though. Having written my workshop session extolling the virtues of social networking and facilitating community of practice, it seemed wrong to suddenly change sides and start rooting for the environment … Also, Mike McConnell was chairing the session and he offered me beer if I would take notes for him … fair exchange, or so I thought! From past experience, the discussion groups can be either really good or really bad. This year was no exception. I know of a few people who didn’t go back to their second discussion group session as they just didn’t think it was worth it. I know of one group where the chair turned up, said he wasn’t sure what they were supposed to be talking about, but that he wouldn’t be there the second day anyway… I think we actually had more people at our second session than the first. Word had obviously travelled that we were having a good discussion and really trying to come up with some answers … either that or someone had heard Mike mention beer. We went into our session and did the usual … little eye contact, talk to no one. I suggested moving the chairs from classroom style rows, into a more discussion friendly circle-ish shape … and all of a sudden people started smiling and talking, and making eye contact! Mike soon put a stop to that with the regulation and totally hateful ‘5 minutes to introduce yourselves to someone you don’t know’. Now this one is a little tricky… I’ve been going to IWMW for 6 years now. There are lots of people I don’t *really* know, but so many people I’ve seen around. So many names I’ve seen on documents and mailing lists, but like I say, I don’t really know them … but I almost feel as though I do. Once we started the discussion it quickly transpired that we had quite a bit to say on the subject … 11 pages of notes in fact. And that only included the stuff that I was quick enough to write down. I also discovered that it’s actually quite difficult to be part of the discussion and write the notes. I wanted to jump in so many times, however, by the time I’d written up what was being said, someone else had got in first – and I had to write up their comments (repeat as necessary)! After the conference I got the train back to London with Mike, his parting words were “thanks for writing the notes babe, just erm, type hem up and post them to me”. I sat at my desk about a week later looking at 11 pages of scrawl … Note to self: this just has to be easier if you do it straight away. Meaningless lines joining up one half a sentence with a whole load of words I couldn’t read, and some I clearly couldn’t spell… Only one thing for it… put the coffee on! I’m such a bugger for vacuuming the cat when there’s a rubbish job to be done. Some time later, the notes started to emerge. What was really lovely about doing this job, apart from finishing it obviously, was the enthusiasm of the session really came back to me. The fact that we actually came up with action points. Things that we wanted to achieve … nothing that could be classed as rocket science, just practical things hat we want to put in place to take the ‘Web Management Community’ from being an idea, to a reality. Maintain the Facebook for IWMW, either year by year or a general IWMW group that we can all subscribe to. Try to encourage as many people as possible to sign up and become a part of it, and to think how we can make it bigger (can we incorporate any of the ideas from the Innovation competition…?). Like I said, not rocket science, but at least doable, something we can put our hands on … unlike the beer I was promised!!! The mailing lists serve a purpose, they’ve worked well for many years to provide information, solutions, a point of contact … can we really call that a community though? When we go to the conference, we are only ever one drink in the bar away from making a fab new contact or a bloody good friend. With Facebook (or something similar) we can put a face to all the names we’ve seen around, or indeed a name to the face (how many people do we see year in year out and just can’t remember what they are called…? ), we can post a comment, or make contact with someone we’ve wanted to speak to but don’t feel we know them well enough, we can invite people to gigs that are half way across the country … they might not be able to go – but god it’s nice to be asked (thanks Claire) … In short, we can create a community. IWMW was the reason I joined Facebook. I wanted to know who else was going to the conference, all the details and any gossip … It’s turned into so much more than that for me though, and clearly that is the case for others too. People are using it, posting work related questions, joining groups that will provide us with more information and more contacts. I’ve managed to get back in touch with people I haven’t spoken to in years, made some really useful contacts, and made some lovely new friends too. Debbie’s contact details are also available on Facebook. The regular guest blog post this month features a number of articles about the Institutional Web Management Workshop 2007 (IWMW 2007) held at the University of York on 16-18th July 2007. In this month’s opening guest blog post Anthony Leonard, who coordinated the live streaming of the plenary talks at IWMW 2007, shares his favourite moments and invites readers of the blog to suggest their preferences. I’ve focused on the lighter side to get things going, but you might want to highlight something that made you think, learn, worry or recoil as much as smile or laugh – anything really that stuck in your mind and is worth a second look. So go on, if you’d like to, why not find your favourite moments from the IWMW 2007 videos, click on the “Link to Now” button and post the URLs back as comments to this blog post. I’ve recently mentioned the videos of the plenary talks at UKOLN’s annual IWMW 2007 event. I’ve also mentioned my experimentation with the Zentation service which integrates videos (served by Google Videos) and accompanying uploaded PowerPoint slides. It strikes me that Adrian’s involvement in this is a good example of a community-led activity – an approach to development which the JISC Emerge project is seeking to support within the JISC development community (as can be seen from a recent presentation I gave on this topic). It also occurs to me that as well as the creation of data from within the community, this example also illustrates use of a number of external services for providing access to the data: Google Video and Zentation have been mentioned previously, and, in addition, the slides are available from Slideshare. This example illustrates the move that we are seeing from use of monolithic services to use of a variety of distributed applications. Within the large-scale enterprise environment an approach based on Service Orientated Architecture (SOA) is growing in popularity, which seems to have many parallels with the lighter-weight approach which is taking place in the Web 2.0 world. With both of these approaches there are many issues which will need to be addressed such as the risks associated with use of third party services, ongoing performance and security issues, rights issues, long term preservation, etc. I’ll explore some of these issues at a later date. As an experiment which built on last year’s use of Access Grid technologies, the plenary talks at the IWMW 2007 events were streamed live and a recording of the talks made which were made available shortly afterwards. The display of Alison Wildish’s talk on “Let The Students do the Talking …” is illustrated and the video recording can be played (note Flash support is needed) . Really good service but would have liked the time displayed somewhere so I could point people to things that were said at a particular time – it’s basically impossible right now (a killer for those 90 minute sessions!). Audio – generally really good – but the panel discussions and audiene questions were not so easy to hear at times – where are the microphones, BTW? Lighting – Good lighting on the speaker at the podium – but again the panel discussions were poorly lit. Many thanks to Anthony Leonard for providing this service. One of the new aspects of this year’s Institutional Web Management Workshop (IWMW 2007) was, appropriately enough, the Innovation Competition. The aims of the innovation competition were to provide an opportunity for workshop participants (and the wider community) to have an opportunity to experiment with lightweight development activities. The key criteria on which submissions were judged were (a) being user-focussed, (b) being lightweight and (c) being ‘cool’. Although many of the submissions were examples of ‘mashups’ it should be noted that the competition did not actually require submissions to be based on software development – real world innovations (a song-and-dance routine, perhaps) could have been submitted. The best submissions were selected by Jeff Barr, Amazon, Scott Wilson, CETIS and Stephen Emmott, LSE – with the audience deciding who the winner was. The audience selected (by an overwhelming majority) Sebastian Rahtz, Oxford University Computing Service, as the winner of the competition for his Alternative course discovery using calendars and maps. This entry allows people who want to attend Oxford University continuing education and computing service courses to find what they want using Google calendar or Google Maps (illustrated) as well as the usual methods. In second place was Michael Nolan, Edge Hill University who submitted three entries, with the Hi from Edge Hill and How To Find Us submissions being particularly appreciated by the judges. The Community Focus Mashup submission by my colleague Paul Walk and the Mashed Museum Directory by Mike Ellis were also felt to have noteworthy features by the judges. All four of these submissions have been awarded Amazon gift vouchers (and many thanks to Jeff Barr and Amazon for donating the prizes for the competition). Innovation competition – great idea. Would be good to also showcase 1-innovative thing from University websites each year. Let’s take a look at what we’re all doing. Can we get speakers from Flickr, Facebook, Google? Inspire us!!! Innovation competition – good idea but wish I had more time to do stuff! And if anybody would like to watch the summary of the final session at IWMW 2007 in which a summary of the submissions was given, then a video recording of the session is available. In the conclusions of the IWMW 2007 event I described how UKOLN will be seeking to enhance its processes for managing our events in order to enable us to response to disasters. The first time I started to consider how technologies could be used to address problems at events was at IWMW 2004 when a bus which was meant to take delegates from their accommodation went missing before everyone had been transported. One of the plenary speakers was included in those left some distance from the venue, but fortunately as he had the mobile phone number of our event organiser, we were able to be informed of the situation and change the running order for the event. This incident led us to add a field on the workshop booking form to allow participants at the event the following year to include details of their mobile phone number. And as that second day of the event (which was held at the University of Manchester) coincided with the London bombings on 7/7 this brought home to us the need to explore contingency plans in case of disasters, and not just inconveniences. Various Web 2.0 technologies (such as mashups), the wide variety of communication tools and the increasing sophistication of various mobile devices is now making it more feasible to be able to inform participants at events of possible problems and to react more quickly. This was very much in my mind when I started to prepare my conclusions for the IWMW 2007 event. Invite participants to provide mobile phone numbers to enable us to contact them in case of last minute emergencies. Have mechanisms in place for bulk sending of text messages (for example using JANET’s new JANET txt service). Provide location maps of where delegates will be travelling from in order for us to make plans in case or disasters such as the current flooding over large areas of the south of England (the location of participants at IWMW 2007 is illustrated). Integrate content from services such as the BBC weather and travel pages and appropriate train services into our event pages (especially for events which may attract overseas participants who may not be aware of these services). As someone who attended the JISC Digitisation conference in Cardiff on 19-20th July 2007 I am very much aware of the problems and uncertainties that can happen (in my case, I was fortunate in being able to return home after the conference had finished – but I did meet speak to several participants at Cardiff and Bristol Temple Meads stations who didn’t know where they’d be spending the night). Has anyone other suggestions on how technological innovations may be used to in case of such problems? The IWMW 2007 event has now started. It seems that the live video streaming of today’s plenary talks was successful. If anyone would like to see the plenary talks for tomorrow (Tuesday) feel free to go to the link to details about the video streaming. Andy Powell commented on a blog post on Facebook and the Institutional Web I published recently which he followed up in a post on Facebook application growth which described some of the reservations he had concerning certain types of developments using the Facebook platform. Similar reservations were expressed in Paul Walk’s post on Playing in the sandpit, while the novelty lasts and Paul Miller explored the issues of The Platform and the Web – what can Facebook and Talis tell us? in Talis’s Nodalities blog, which highlighted the dangers of use of a closed platform. Whilst agreeing with many of these points, I still feel that we can’t ignore technologies which appear to be successful (let’s not ignore Microsoft Windows, for example). 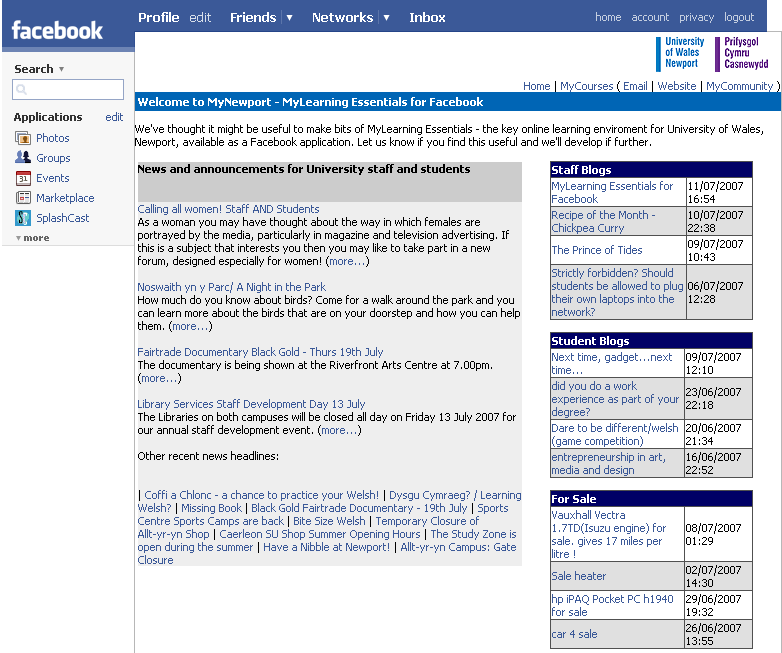 So I very much welcomed “MyNewport – MyLearning Essentials for Facebook” – Michael Webb’s submission to the IWMW 2007 Innovation Competition. MyNewport is the VLE/portal used by staff and students at Newport College, which includes access to course material, news, blogs, forums, library access etc. MyNewport is a Facebook application that allows students to access to MyLearning Essentials resources from Facebook. In effect this allows students to start creating their own personal learning environment in a platform other than the one provided by the University. Newport College have targeted Facebook at the moment as it’s the fastest growing community, but if the users like the idea but want to work in another environment then that is fine – as applications can be created applications for them as well. Apparently it took about a day and half from conception of the idea and joining the Facebook developer community on 10th July to launching it as a viable application for our students to use (or comment on) on the 11th July. It was straight forward as the college’s VLE is built from components that can easily be repurposed and uses open standards such as RSS to allow information to be passed to the Facebook application. Further information on this submission is available on the Submissions page of the IWMW 2007 Web site. Not all of the entries to the IWMW 2007 Innovation Competition consist of mashups of text and images from various sources. Graham Attwell, a member of the JISC Emerge project team, has created a mashup of two video clips (the JISC cartoon about the E-Framework and a talk given by Graham at the ALT-C 2006 conference) which allows users to see the argument for approaches to development of e-learning services from two different viewpoints – that of institutional management as epitomized by JISC and the learners viewpoint as explained by Graham Attwell. This, I feel, provides an interesting example of scholarly debate which makes use of YouTube. Last month Andy Powell, on the eFoundations blog, asked whether the digital library development community was heading in the right direction in its approaches to digital repositories. Andy suggested that the “environment is changing, largely because of Web 2.0“. In a response my colleague Rachel Heery suggested that “there is potential for institutions to push out their repository content to other services that have a more up to minute Web interface“. A submission to the IWMW 2007 Innovation Competition from Stuart Lewis, University of Wales Aberystwyth provides a response to this discussion, providing a Web 2.0 style interface to data gathered using the OAI-PMH protocol from the RAOR and OpenDOAR services, mashed up with Google Maps. The entry to the IWMW 2007 Innovation Competition submitted by Mike Ellis provides a great example of innovation that is taking place in the museums sector. The Mashed Museum Directory entry, which mashes up data from several sources, is based on work which initially took place at the UK Museums on the Web mashup day facilitated recently by Mike. Mike has recently given a summary of this update. Paul Shabajee (ILRT/HP Labs) has submitted an entry to the IWMW 2007 Innovation Competition which is intended to demonstrate a data-driven Web site for an event (the event in question being the UK Museums and the Web Conferences held in 2006 and 2007) using a tool by the Simile project called Exhibit. Paul’s motivation in producing this was simply to play with Exhibit and see how it works and how easy it was. Paul chose the UK Museums on the Web conference data simply because he was attending the event later that week. The third submission to the IWMW 2007 Innovation Competition was also from a colleague at UKOLN. As I’ve commented previously Julie Allison made use of the software to process various RSS feeds associated with the IWMW 2007 event. As I’ve described Julie’s submission previously, I’ll not repeat it. What I would say, though, is that the description of Julie’s work clearly inspired one reader, with AJCann (a frequent contributor to this blog) subsequently announcing that he is a Pipes Virgin No More. For me this is a good example of one of the aims of the competition – encouraging others that it may be worth ‘just trying it’. My colleague Paul Walk has submitted an entry to the IWMW 2007 innovation competition. As Paul has described in his blog this example takes the locations of the host institutions of the participants and displays them in a Google Map. This is a very mainstream use of Google Maps (indeed a variety of maps of the location of previous IWMW events and the location of the speakers and facilitators at recent events are available on the UKOLN Web site). The value-added approach taken by Paul is to integrate this with a cloud map of the topics which the delegates are using in their blog posts, del.icio.us bookmarks, Flickr photos, etc., based on the data which a number of the delegates provided when they registered. Paul used this exercise as an opportunity to gain expertise in use of Ruby and in the various APIs provided by the various Web 2.0 services. The data he used was then made available so that it could be used by others. And this also helped us to think about the data capture and work flow processes we may wish to enhance to support future events. In response to a post in which I announced that Data Available For IWMW 2007 Competition I received a comment from Tim Beadle (a Web developer in Bath) who suggested I look at Timeline from MIT. So I did and started to put together a timeline of IWMW events. However after the 30 minutes I allocated to this task I found that after I’d added my data the script wouldn’t run. I then sought help on the web-support JISCMail list and Owen Stevens not only quickly spotted the problem (an error in the dates) but also enhanced the interface. I have commented previously that one of the innovations at this year’s Institutional Web Management Workshop (IWMW 2007) is the innovation competition. The aim of the innovation competition is to provide an environment for participants (and other interested parties) to provide examples of lightweight innovations which may be of interest to workshop participants. We hope this will provide an opportunity for those who submit examples to benefit from the staff development his may provide and the feedback which may be received. We also hope that the examples which are provided will provide a context to stimulate discussion about the relevance of such work within an institutional context. Will the examples be sustainable, for example, and will they scale up to large scale usage? And what about the implications of copyright, data protection, etc.? I’m pleased to say that, to date, we have received eleven submissions. In order to gain feedback from a wide audience and open up the discussions I will be posting a series of articles will a brief summary of the submissions and invite your comments. Note also that we are still accepted submissions, so if you have something to contribute, please view the submission template and provide the relevant details (I suggest as a comment to this post in the master UK Web Focus blog). Please, though, do not simply submit an example of work you have already completed – this is unlikely to pass the “cool’ criteria! You should also note that the title is “innovation competition”. You do not necessarily have to submit a mashup, or even an IT solution. A witty solution, a joke, etc. might work – how about, for example, a pastiche of last year’s social event (featuring your’s truly). At the Institutional Web Management Workshop 2007 we’ll be encouraging the speakers and workshop facilitators to maximise access to their resources by providing a Creative Commons licence for their slides and other related resources. But how should the speakers go about this? The approach I have taken is to include a Creative Commons logo on the title slide and also on the handout page. In addition for the past few years I have included the location of the PowerPoint file on the title slide and also on the handout page. This is illustrated in the image. This approach enables anyone who wishes to reuse the content to easily find the master source. In addition it allows the slides to be downloaded during a presentation, if a network is available. This can provide accessibility benefits if a user cannot read the slides for whatever reason. I also use the title slide to give a summary of the Acceptable Use Policy which will apply to the talk I give (I normally give permission for the talk to be recorded, for example). The slide also contains hyperlinks to various resources, which can be followed if the slides have been downloaded. For the title slide this normally included a link to a del.icio.us tag which bookmarks resources mentioned in the presentation, together with clarifications of the Creative Commons licence (which normally states that not all images may be covered by the Creative Commons licence). Feel free to make use of this approach if you think it might be helpful to you and users of your slides. The aim of the panel session is to address the tensions which often seem to occur within the higher education sector when dealing with commercial companies. Marieke has asked me to take part in the panel. My view is that the commercial vs. non-commercial software is no longer a major philosophical debate: we are all New Labour in our thinking, these days. And the open source debate is primarily about fitness for purpose, rather than open source ideology. A: An emphasis on the service owner, using non-commercial tools. The extremes of the sector may represent the view of the ‘open source fundamentalist‘. B: An emphasis on the service owner, using commercial tools. The extremes of the sector represent the view of the ‘vendor fundamentalist‘. D: An emphasis on the user, using commercial tools. This may be the sector in which an organisation which makes use of commercial products sees itself. However rather than reducing these sectors to such simple divisions, of more interest might be to explore the tensions between organisations will a user focus and those which take a more managerial approach. Quality content: Members of institutional Web management teams have always prided themselves on developing systems and deploying software which can ensure that the content on the Web site conforms with a variety of rules. Quality experience: However we are starting to find that some institutions are now emphasising the importance of providing a quality experience for its users, and, providing the content is not illegal, give less of an emphasis on the quality of the content. Compliance with accessibility rules: Institutions may have policies which state that all corporate pages will comply with WCAG AA guidelines for Web accessibility. They may feel that this policy will ensure that they will not be sued under accessibility legislation. User-focussed approach to accessibility: However some institutions may feel that WCAG guidelines are dated and, in some areas, inappropriate and will be willing to infringe the guidelines if this can enhance the accessibility and usability for their target audience. Mandation of use of open standards: Institutions may insist that Web services comply strictly with HTML and CSS standards. Pragmatic approach to use of open standards: Other institutions may prefer to use Web services which comply with HTML and CSS standards, but may be willing to drop this requirement if the service can provide a useful function for the institution. Bans based on ideology: In a recent discussion on the web-support JISCMail list there was a suggestion that HTML email should not be allowed as it is often used for marketing purposes. Providing flexibility: In a response to the discussion on use of HTML in email others argues that (a) marketing is an acceptable activity and (b) it is desirable to allow end users choice on how they wish their email to be delivered. Of course the situation is much more complex than pictured here, and there are many cases in which strict compliance with rules may need to be enforced. But the boundaries are shifting, I feel. Much of the talks and discussions at previous IWMW events, for example, have covered areas in which Web management teams would like greater managerial control (with Andrew Aird famously suggesting back in 2002 that “Web Team has ultimate say-so. No buts“). There’s a need for the Web management community to rethink its values and the approaches we have traditionally taken. We’re not living in the 20th century any more, after all! In order to support the Innovation Competition which is a new feature of the annual Institutional Web Management Workshop we are providing access to a variety of RSS feeds, including feeds of the location of all eleven IWMW events and the location of the host institutions for plenary speakers at all of the events. In addition RSS feeds for the plenary talks and workshop sessions for recent events are also available. And as well as the data provided by the event organisers, there are also links to various related feeds, such as bloggers at the event and feeds from services such as del.icio.us and Flickr. This data can be used by delegates at the event who may wish to submit an entry to the Innovation Competition (and we also invite submissions from people who can’t attend). The Yahoo! Pipes application would appear to be a tool worth exploring in this context. And I’m pleased that my colleague Julie Allison has developed an application based on this tool which takes the last 10 Flickr, del.icio.us and Technorati tags and mixes them with the IWMW 2007 news feed. This is illustrated below. Julie informs me that this simple use of Yahoo! Pipes took her about 15 minutes to write (if ‘write’ is the correct term to use for a graphical development tool). And as the source of this application is available it can form the basis of richer applications. An opportunity for someone, I think. How many public Web servers are there at your University? And how have the numbers changed over the past 5 years? Are you running more servers, as the range of services you provide grows, or have the numbers of servers decreased due to rationalisation in order to avoid duplication of effort across the institution? I published an article on A Survey Of Numbers of UK University Web Servers in June 2000, with a follow-up article on An Update Of A Survey Of The Numbers of UK University Web Servers which was published in March 2002. The survey was carried out using the online Netcraft service, by using a wildcard (*.ox.ac.uk) to obtain details of the numbers of Web servers in, in this case, the Oxford university domain. This process was repeated manually for all (~160) UK HEIs. A histogram for the results of the 2002 survey is illustrated. How have things changed in the past 5 years? It would be possible to repeat the manual survey – as can be seen, the online Netcraft survey service is still available. However in a Web 2.0 environment in which many lightweight Web-based tools are available it would not be sensible to repeat the methodology. It strikes me that the Netcraft results page is well-suited for screen-scraping (immediately after the “Results for *.ox.ac.uk” text is a line which says “Found 356 sites“. So while this interface remains, the data can be programatically extracted, stored and displayed, possibly in a graphical format). The Dapper application could, perhaps, could be used for this purpose. After all, as I’ve described previously, Dapper has been used to create Blotter, which scrapes Technorati ranking data on a daily basis, stores this data and display the trends graphically. But rather than doing this myself, I’d like to suggest that this might be a suitable example for the IWMW 2007 Innovation Competition – this should be lightweight and user-focussed (providing data which can detect trends across the community). It could be possible to provide an interface for a user to supply their own domain name, although another approach might be to take the domain names for the community (or perhaps a regional subset of the community) and display variations across the community – that, I think would be cool (and ‘coolness’ is one of the criteria for the competition). This year’s Institutional Web Management Workshop, at the University of York, starts after lunch on 16th July 2007. Back in 2004, when the event was held at the University of Birmingham, I opened the workshop by showing a video clip of “Steve Ballmer’s [of Microsoft] crowd pleasing repertoire of the grotesque“. It was a great light-hearted way of opening the event (and worth watching if you’ve not seen it before). Should we do something similar for this year’s event, I wonder? A few month’s ago I posted about Viral Marketing from Store Wars to Web 2.0. Several amusing video clips were mentioned, including, with an IT theme, the well-known “Web 2.0 The Machine is Us/ing Us” and the less well-known “Response to the ‘Web 2.0 The Machine is Us/ing Us’. A favourite of mine is “Introducing the book” and recently Mike Wald told me about the “Apple Irack” video clip. All worth watching – but are there any others which might provide a fun start to a three day event aimed at members of institutional Web management teams? Or are any of the ones I’ve mentioned worth showing? Today’s guest post is from Peter Reader, Director of Marketing and Communications at the University of Bath. 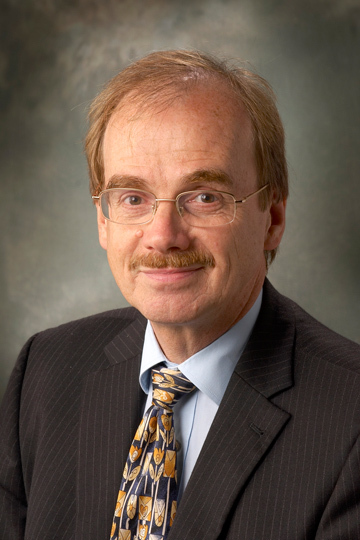 Peter will be giving a plenary talk entitled “Marketing Man takes off his Tie: Customers, Communities and Communication” at this year’s Institutional Web Management Workshop (which, incidentally, is now fully subscribed). And, as you’ll see from Peter’s post, he will be address a hot topic of the moment, which has been the focus of recent discussions on this blog – the role of social networking environments such as Facebook. When Brian invited me to speak at IWMW 2007, little did I know what was to follow. I’ve very much a data immigrant, but I’m also an ideas person and, for example, I treat my PC as I treat my car. I plug it in and switch it on – and I expect someone else to be able to turn my ideas into reality, just like I expect the garage mechanic to know that ‘it’s got a little rattle’ means exactly what needs fixing. But I still know what I want. Where my approach differs is that I don’t want to pay garage bills for my ICT. I am absolutely convinced of the importance of e-communications and e-marketing, not just for the recruitment of students but in all the other markets in which universities operate. As my University’s Marketing Director, never a day goes by without me being offered one package or another, including advertising of course. What’s more, it is clear change is taking place ever faster. Take the media – remember when the Times Educational Supplement was, in effect, a listing of all teaching jobs in the country. Not any more; it’s now a magazine. And The Higher, trade paper for universities, is also seeing its advertising revenue disappear; is that, maybe, why Murdoch sold The Times supplements? PR and marketing used to be all about campaigns, controlling the message, managing the communication channels and promoting the product. Product, Price, Place, Promotion. All neatly defined. But these old ideas of ‘control’ look more and more unrealistic. Now the talk is of focusing on the idea, ‘influence’, public reactions and not public relations, viral marketing, students as customers, B2B, client management and CRM, with the web and web technologies seen increasingly as the university’s most important marketing tools. As for social media, when most of our students arrive at university with a Facebook account, why are universities bothering to think about our own sites? Most prefer to use their own email address; the vast majority have their own account when they arrive and the old idea of universities offering email accounts is no longer any big deal. And, too, the idea of there being one youth market is just rubbish. Superbrands, such as Nike, are giving way to technology brands, such as Google, which has just been voted one of the top 10 companies for whom students would like to work. And all the time there is the staggering growth in user-generated content.How can universities harness this opportunity to best advantage? The product is still the key, but we have to give the customers, including our students and potential students, something worth talking about, to differentiate themselves. And universities are not very good at doing this; evidence from the Open University is students cannot tell the difference between institutions. What about their Web sites? We need to innovate, but universities are just so conservative. I said I’m an ideas person; what about yours? This week sees a number of guest blog posts from plenary speakers at this year’s Institutional Web Management Workshop, which will be held at the University of York on 16-18 July. Today’s guest blog post is by Paul Boag. The title of the post is “Social participation for student recruitment“. I am really looking forward to attending my first IWMW this year. In particular I am excited about the number of sessions touching on the subject of social participation. Not that social participation is anything new. I remember writing my dissertation on a virtual community called “The Well” back in 1994. In fact the Web itself is very much about social participation, the idea of sharing information in a peer-to-peer manner. However, it is certainly true that “community” is experiencing a renaissance. Sites like Flickr, Digg, Delicious, and MySpace are appearing all the time, each dedicated to user generated content and social interaction. The business community certainly recognizes the value of social participations, sinking millions of dollars of venture capital into these yet unprofitable businesses. In fact business has always been very switched on to the value of peer-to-peer recommendation. They are acutely aware that a recommendation from a unbiased third party (such as a friend) is worth considerably more than endless TV commercials or billboard advertising. It is therefore unsurprising that we are seeing elements of social participation such as ratings, reviews and recommendations, appearing on ecommerce sites like Amazon. Even higher education websites are beginning to embrace the social participation phenomena with a growing number of institutions giving students blogs and encouraging participation in wikis, forums and other social software. So does the “social participation revolution” offer a new and unique way of reaching prospective students? In my opinion it does, but I believe there are many opportunities to move beyond the current approach being used by many institutions. As I see it there are two ways the social participation movement is currently being used by higher education institutions. The first is implementing social networking facilities of their own sites and the second is driving traffic by participating in existing social networking sites like YouTube or MySpace. In both these scenarios I would suggest that a slight change of approach would bring substantially improved returns. One of the factors that has spurred the explosion in social participation is the ease with which community software can be implemented on a website. Giving students a blog or implementing other similar tools is relatively straightforward but technology is not what drives social interaction, people do that. Empowering existing students to speak to prospective students is a powerful (if slightly scary) way of promoting your organisation. As in business, HE institutions are recognizing that peer-to-peer recommendation is worth considerably more than any amount of traditional marketing. However, simply adding some technology to your site is not going to make that interaction spontaneously happen. It has to be nurtured and encouraged by one or more individuals dedicated to the task. Although building a community and social interaction cannot be forced or controlled, it can be encouraged. In many ways it is like tending a garden. In the early days it needs a lot of feeding and protection. As it grows it can require pruning and at times it may even need dead wood removing. The garden metaphor aside, a good community is the result of a lot of effort behind the scenes to make it a reality. Currently I get the impression that many website owners (not just those in the HE sector) have the impression that if you build community tools, then the job is done. I am seeing similar first steps being made in the HE sector in leveraging existing social networks. I know of Universities who have posted videos to YouTube and other institutions who are exploring the use of social sites like del.icio.us, MySpace or third party forums. However simply utilizing these sites does not guarantee you will reach your audience effectively. Successful Guerilla marketing using social networks involves two key factors that are largely missing from the HE campaigns I have seen. The quality of the message being conveyed is fundamental to its success. Its not about how “slick” your message is, rather it is about how well it engages with your potential audience. Let me share an example of what I mean. I recently came across a University who had submitted a promotional video to YouTube. It was a well-produced video, which was professionally put together. They also had the foresight to submit it to YouTube rather than just put it on their own website. However, despite this it was unlikely to grab anybody’s attention. In order for a video like that to succeed on YouTube, people have to want to associate with it. By voting for a video or passing it on to a friend they are saying that they approve of, or associate with, that piece of content in someway. Different groups of people like to be associated with different values but it is fair to say that prospective undergraduate students likes to be associated with what is funny or “cool”. If your content doesn’t meet these criteria then people are not going to want to be associated with it. They are not going to vote for it or pass it on and so other more popular items will crowd out the content. When it comes to other social sites like Digg, MySpace or even posting on forums the issue of trust and reputation comes to the fore. With so many individuals and organizations effectively spamming these sites in order to promote their business or product, it is important to build a reputation and relationship, which in turn earns you the right to post about your course or institution. The primary way you build this trust is by contributing content of worth over a period of time and ensure your promotional messages are left firmly in the background. Over time the audience you are communicating with will naturally start enquiring more about what it is that you offer. I myself am a member of several communities made up of prospective clients who maybe interested in my web design services. However, it is extremely rare for me to promote the services I offer in these communities. Instead I answer questions and help out in anyway I can and yet I regularly receive leads because of my contributions. No hard sell is required. A little knowledge can be a dangerous thing and I believe that nowhere is that more true than in the realm of social participation marketing. I often encounter management who perceive marketing through things like social networks as a “cheap option”. After all there is no media spend and no print costs. However, although the costs in these areas are extremely low there is an enormous overhead in time and manpower. If HE institutions want to see student recruitment through social participation as a viable reality they need to invest properly in the human resources to achieve it. Building peer-to-peer communities, encouraging student ambassadors, seeding forums, and contributing to social websites all requires time. Too often this work falls to somebody from within the web or marketing team. This person almost always has far too much on his or her plate to do the job effectively. Only when adequate resources are dedicated to the task will we begin to experience a real return on investment. Paul Boag is a user interface designer and long time advocate for virtual communities. He runs a web design company in the south of England called Headscape and is a prominent blogger at boagworld.com. He also hosts one of the biggest web design podcast currently online, as well as writing for publications such as .net magazine and Think Vitamin. This week I’ll be publishing a number of guest blog posts, from plenary speakers at this year’s Institutional Web Management Workshop, the theme of which is “Next Steps for the Web Management Community“. I should also add that there are still a small number of places available – but we would advise you to book a place quickly (the cost, incidentally, is £355 per person which includes 2 nights’ accommodation). The guest posts begin with Alison Wildish, who will speak on the first day of the event. And during a week in which there has been much interest and discussion on the role of social networking services such as Facebook it is clearly timely for Alison to introduce her plenary talk on “Let The Students Do The Talking” – and please feel free to respond to Alison’s post. Alison is Head of Web Services at Edge Hill University where, for the past seven years, she has led a team responsible for the development of the corporate Web site(s), intranet sites and Web services (which include the Web Services blog). Prior to joining Edge Hill, Alison was developing Web applications in the commercial sector. Most recently Alison has led the University portal project, the development of applicant and community Web sites, and has contributed to IDM and Single Sign-On implementations. In my abstract for my “Let the Students do the Talking” session at July’s IWMW I talk about social networking and how “we’ve re-developed our thinking and systems to take advantage of this“. Whilst I stand by my statement it now feels somewhat naive almost as if I imply we have the answers when in fact the opposite is true. I firmly believe that student support should sit right up their alongside teaching and learning at a University and I believe it is the ‘support’ arena where social networking can have the biggest impact. During the recent shootings at Virginia Tech in the US students flocked to Facebook to inform friends of events – a platform that students have adopted as their preferred communication tool. When students have been disgruntled about staff or services, within a University, Facebook has been used by the students to air their views. So what can Universities learn from these behaviours? A lot. Whilst we “think” we’re in touch with the students needs unless we’re adapting in line with their behaviours we could be missing a trick. With this in mind I certainly favour the “if you can’t beat them join them” approach. The majority of our ‘traditional’ students come to University equipped with a range of online skills, preferences and identities. When we questioned our students at last years Freshers Fair more than 95% of them had a MySpace, Facebook or Bebo account and used it regularly. We took the view that as students were familiar with these less formal environments we should adopt some of the same principles for the University supplied services and we did.In September last year we launched the “Go” portal for students which embedded some social networking and user-owned technologies with our institutional systems. We included a discussion forum which has proved hugely successful in allowing students to build and develop their own “communities” and a web notice board which is managed by the students themselves.Following on from this we launched a website for our applicants (Hi) in March which again is based around the community theme. The site allows our applicants to chat with our students (who also blog on the site) directly giving them an informal route to find out more about University life. So have we really re-developed our thinking? Well yes and no. I’d like to say we’re getting there and listening to the student voice and adapting our services and systems accordingly. We’re in the process of re-developing Go to provide greater integration with social networking sites and allow for more customisation and integration of user owned technologies. From a student perspective its great and we feel it gives us additional routes to provide student support, maintain the engagement with the University and ensure our messages can be communicated to them. On the other hand though we’re a University, a “new” one at that, and we’re working hard to establish our brand and reputation, social networking sites and user owned technologies allow our students to choose the information they engage with and their channels of choice. They have the freedom to develop these informally, outside of University constraints, and whilst that’s incredibly empowering we do need to consider the impact this has in relation to enforcing a code of conduct, the message this gives to our prospective students (outside ‘Marketings’ control) and how this can be utilised within (or distract from) the teaching and learning. So are we really that confident and prepared to “Let our students do the talking…” – that is a debate to be had! This year’s Institutional Web Management Workshop (IWMW 2007), the eleventh in the series, will be held at the University of York on 16-18th July. We always aim to make this event, which is aimed at members of institutional Web management teams, very participative in nature with an emphasis on the workshop sessions, discussion groups, debates, etc. with the plenary talks providing a shared context for the event. This year we are extending the participative aspect of the workshop by inviting workshop delegates to take part in an innovation competition. Submissions to the competition should be user-focussed, lightweight and ‘cool’ – we hope the competition will provide an opportunity to try out some of the lightweight Web 2.0 services in a friendly, informal environment. In order to provide some data which can be used in the competition (although there is no requirement to use this data) we have provided a number of RSS feeds related to the IWMW events. This includes the news feeds for recent events, syndicated content of the various sessions for the last three years, blog postings for last year’s event, the location of all eleven of the events and details of the plenary speakers at all of the events. In order to illustrate how this data can be used, we have a map showing the location of this year’s plenary speakers. A better picture of the geographical spread of the speakers at all eleven of the events can be seen from the map showing the location of HE institutions of the speakers since 1997. The RSS feed contains the speakers’ names and biographical details, the location of their host institution and the date on which they spoke, with the ACME GeoRSS Map Viewer service processing the data. Anybody fancy doing anything else with the data? A tag cloud, perhaps, or even using the date field (which I’ve not used) to show the distribution for different years. Or even, if you’re feeling adventurous, a timeline based on the data. I’ve mentioned previously that bookings are open for the Institutional Web Management Workshop 2007 (IWMW 2007), the annual event organised for members of institutional Web management teams (and note that this year the capacity is limited to 180 participants, so early booking is recommended). This is the eleventh in the series. As regular attendees will know, every year we seek to introduce something new to the event, in order to provide an opportunity to demonstrate examples of Web and related IT developments which may be new to participants. Last year, for example, we hosted Brian the Brain Chatbot, a speaking avatar which provided information about the event. And at IWMW 2005 we exploited the WiFi network which was available for workshop participants by providing access to a range of networked technologies, including chat facilities and a wiki. We will be continuing to innovate this year. However, more importantly we are encouraging workshop participants to take part in the Innovation Competition. IWMW 2007 participants are invited to submit lightweight examples of innovative uses of Web technologies which may be of interest to fellow participants. ‘Mashups’ which integrate content from multiple sources. Informative, educational or entertaining use of 3-D virtual environments such as Second Life. Seamless access to content using technologies such as OpenID. The benefits to users i.e. what users will gain from using this innovation. How easy it was to develop and deploy the innovation. Innovation which is cooler than other submissions. For example, submissions which get people talking over coffee or which they will seek to deploy once they return to work. Alternatively examples which make other participants laugh might be rated as cool. At the time of writing we haven’t finalised on any prizes for the competition – we would prefer participants to compete primarily for fun and to share their work with others, rather than for mercenary reasons. However we will be providing a prize (or prizes) as an appreciation of the work done. We will also be providing data which participants may like to make use of in the competition. A page containing access to a variety RSS feeds and structured geo-location data for previous IWMW events is available – together with a link to a mashup of the location of all eleven of the IWMW events, to illustrate how easy it can be to create a Google Maps mashup. Bookings are now open for this year’s Institutional Web Management Workshop (IWMW 2007) . This event, which is aimed primarily at members of institutional Web management teams, will be held at the University of York on 16-18th July 2007. The event, the 11th in the series is, once again, being chaired by my colleague Marieke Guy. This year’s theme is “Next steps for the Web management community” and will focus provide an opportunity for the community to explore ways in which collaboration can help support the challenges which the community face. It should be noted that the capacity for this year’s event is limited to 180 participants (fewer than last year) – so we’d advise early booking to avoid disappointment. And if you look at the list of sessions, you should find many topics of interest.